The NBA free agency period is quickly approaching, and although the focus will surely be on players such as LeBron James, Paul George and Kevin Durant there is another group that should garner just as much interest. The restricted-free-agent market is typically filled with players coming off their rookie contracts and looking to get a big payday — however, that payday hasn’t been coming lately. The restricted-free-agent market has changed from what it once was. Instead of signing these players outright, a lot of teams are letting their restricted free agents test the market and sign an offer sheet. Then they’ll decide if they would prefer to match the contract or just let the player walk. The problem comes from the salary-cap spike during the 2016 free-agency period. Every team in the NBA had cap space and they all spent as much of it as they could. Ridiculous contracts were given out across the league and many of those contracts are still on the books now. As a result, not as many teams have the current cap space necessary to go out and sign free agents. This is especially true in the restricted-free-agent market. Restricted free agency is very much the player betting on himself. It’s betting that his value is something teams are willing to spend on to the point where a deal can’t be matched, or in some cases that a bidding war is created. Players who took that risk last season though lost in a big way. Nerlens Noel, a former top 10 draft pick and a player who was expected to get a payday, had to sign the qualifying offer with Dallas. He reportedly passed on a four-year, $70 million offer in expectation of a max contract. He never got that offer. Kentavious Caldwell-Pope went the entirety of his time as a restricted free agent with no major deals. Detroit eventually renounced his rights and he was forced to sign a one-year $18 million contract. Alex Len, a former top-five pick, expected to leave Phoenix. He had to sign the qualifying offer after nobody would make him a serious offer. That’s just three players who bet on themselves and couldn’t get the deal they wanted. There have been others, such as Bazz Muhammad and Nikola Mirotic, who have proven to be examples of how restricted free agency can be dangerous. Especially as the summer goes on and teams fill in more cap space. With free agency beginning on July 1 and a decent market of restricted players out there, who could be at risk of losing out on money this summer? The Lakers and Julius Randle have had a very complicated relationship. Randle has proved to be a solid offensive player in Los Angeles with up-and-down defense. He’s been more than capable of starting for the Lakers, but he struggled to consistently crack Luke Walton’s lineup. Why coaches choose to go with the players they do is something only the coach knows, but the assumption is that Randle’s defensive efforts had something to do with his inconsistent starting role. Randle is going to be testing the free-agent market. The Lakers might have drafted him No. 7 overall in 2014, but their interests lie in players such as Paul George, LeBron James and Kawhi Leonard. Maybe if they swing and miss on all three of them, then Randle could gain some leverage in contract talks. However, the Lakers don’t seem to view re-signing him as a priority and that could hurt his overall value to other teams making offers. 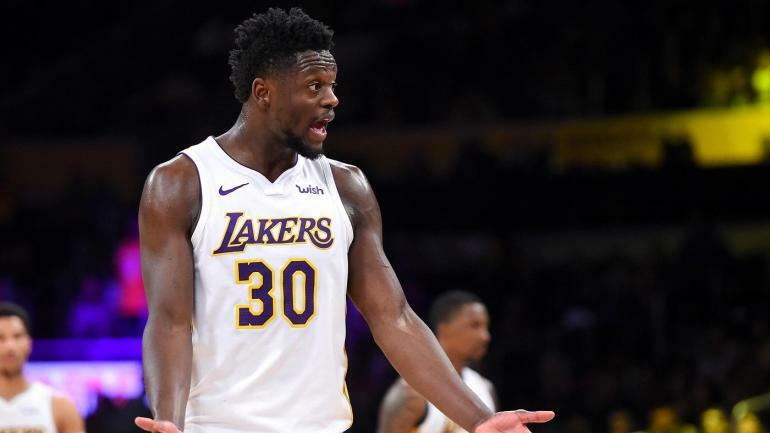 They know Los Angeles isn’t concerned about matching and that could lead to smaller offers for Randle that he’s initially willing to pass on. As time goes on though and teams fill out roster spots, he could find himself without a team or a contract. One of the teams Randle has been linked to early on is the Mavericks, but they also have been heavily connected to DeAndre Jordan. Maybe Randle has more suitors, but right now he’s in a rough situation in terms of how he sees his own value and how the rest of the NBA might see him. Marcus Smart has been a great defender for the Celtics and has proved to be one of those gritty tough guys who fans love. He tries hard and his ability to guard any backcourt player has made him extremely valuable to Boston having one of the NBA’s best defenses. That said, Smart is very much a player who succeeds thanks to the system he’s in. This isn’t to discredit his talent. Smart is phenomenal on the defensive end and finds ways to hide his shooting struggles on offense. He also is playing for a coach in Brad Stevens who is well known for bringing out the best in a player’s abilities. The organization he plays for is run by one of the most cutthroat executives in the NBA in Danny Ainge. If the Celtics can get Smart at a discount then they’re going to do just that. It would not be surprising if Smart was forced by Boston to go out and sign a qualifying offer before the Celtics are willing to work with him. That’s where Smart’s value to Boston becomes a problem for him. What he brings to the Celtics is far more valuable to them than it is to the rest of the NBA. Smart is great at what he does, but his weakness as a shooter isn’t something that teams want to pay big money for in today’s NBA. He is a career 36 percent shooter from the field. He shoots 9.5 times a game. Where, besides Boston, is someone going to find value in that? When the Trail Blazers traded for Jusuf Nurkic the hope was that he would be the big man down low that compliments Damian Lillard and C.J. McCollum. In flashes, that’s exactly what he was. There have been moments in Portland, especially when he first arrived, where that triple threat looked just as deadly as everybody in Portland wanted it to be. The problem comes with all the times it didn’t work. Nurkic is a slower traditional big. He needs the ball in his hands to be effective on offense and that isn’t great for a Portland team that needs the ball to be in Lillard’s or McCollum’s hands almost all the time. To his credit, he became a better defender last season than he ever was in his career, but his weaknesses on that end were exposed in a big way against Anthony Davis and the Pelicans during the playoffs. Nurkic now enters restricted free agency with one of the weirdest journeys to get to this point. He flamed out of Denver after it became obvious that he wasn’t a part of the Nuggets‘ future anymore. He arrives in Portland and immediately makes an impact only to get injured before the playoffs. The Blazers enter a season with expectations of winning, and a capped out roster to prove it, only to flame out in the playoffs again. Nurkic was nowhere to be seen for that entire playoff series. Portland needs to clear out cap space desperately. Evan Turner, Meyers Leonard, Maurice Harkless and Al-Farouq Aminu take up 40 percent of the Blazers’ cap space. There’s no flexibility for them right now to make moves. If they let Nurkic walk then that’s just a free chance to save money. Nurkic’s situation isn’t like the others. He’s probably going to get a decent deal wherever he signs, but it’s going to be far less than what he should be earning. He’s missed potential in a contract. If Nurkic was always the player the Blazers wanted him to be then he would be a max contract player. He’s very much not a max contract player and will not be getting that kind of deal. When Gordon Hayward left the Jazz, that was supposed the big opportunity for Rodney Hood. Someone in Utah had to score and he was going to be the guy to do it. Instead, the Jazz quickly put him on the trade block and eventually moved him to Cleveland in a deadline-day deal to acquire Jae Crowder. That should have been an even better opportunity for Hood. The Cavaliers needed players who could play defense and shoot 3-pointers. Hood responded by shooting 35 percent from 3-point range in the regular season and falling into the muck that was the Cavs’ horrible defense. Even worse, he fell completely out of the Cavaliers’ rotation in the playoffs and only made an appearance in the NBA Finals out of desperation. It would be surprising to see Hood get a good deal at this point. He played his way out of two situations where he could have proved himself as worthy of a big payday. With teams already low on salary-cap space as is, it wouldn’t be surprising if he was forced to take the Cavaliers’ qualifying offer to prove himself next season. If he doesn’t, the already limited restricted-free-agency market could leave him on a very small deal. It’s unfair that someone who broke out last season is probably not going to get paid what he should. Montrezl Harrell was a diamond in the rough for an injured Clippers team last season. He’s an undersized big man who showed a solid touch around the rim with even better rim running skills. The problem is that he’s just not good enough. Very few teams in the NBA need a backup center. Even fewer of them are going to shell out big money for them. In a regular market, Harrell could probably command a decent deal, maybe $10 million per year if someone really liked him. In a restricted market, with a lot of teams trying to cut corners on deals, he’ll probably fall somewhere closer to $5 million or $7 million. It’s a shame. Harrell was a legitimately good player last season and someone is probably going to get him on a bargain. That’s just how the restricted market pans out sometimes.